Most of the known chemical elements are metals, and many of these combine with each other to form a large number of intermetallic compounds. The special properties of metals their bright, lustrous appearance, their high electrical and thermal conductivities, and their malleability suggest that these substances are bound together in a very special way. The fact that the metallic elements are found on the left side of the periodic table offers an important clue to the nature of how they bond together to form solids. These elements all possess low electronegativities and readily form positive ions Mn+. Because they show no tendency to form negative ions, the kind of bonding present in ionic solids can immediately be ruled out. The metallic elements have empty or nearly-empty outer p-orbitals, so there are never enough outer-shell electrons to place an octet around an atom. These points lead us to the simplest picture of metals, which regards them as a lattice of positive ions immersed in a sea of electrons which can freely migrate throughout the solid. In effect the electropositive nature of the metallic atoms allows their valence electrons to exist as a mobile fluid which can be displaced by an applied electric field, hence giving rise to their high electrical conductivities. Because each ion is surrounded by the electron fluid in all directions, the bonding has no directional properties; this accounts for the high malleability and ductility of metals. This view is an oversimplification that fails to explain metals in a quantitative way, nor can it account for the differences in the properties of individual metals. A more detailed treatment, known as the bond theory of metals, applies the idea of resonance hybrids to metallic lattices. In the case of an alkali metal, for example, this would involve a large number of hybrid structures in which a given Na atom shares its electron with its various neighbors. The most useful treatment of metallic solids is based on the molecular orbital approach. It is best understood by considering first a succession of molecules based on lithium (or any other alkali metal having a single s electron in its valence shell). The figure below shows how the MO wave functions for Li2, Li3 and Li4 will look. These are all constructed by combining the individual atomic s functions just as is done in simple MO theory. The only thing new here is that the new molecular orbitals extend over all the atoms of the metal, and that the orbitals of intermediate energy possess both bonding and antibonding character in different regions. 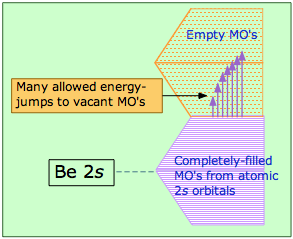 Every time we add another atom, we get two new MOs, but since each atom contributes only a single valence electron, the MOs are never more than half filled. If we extrapolate this to a giant molecule LiN containing a very large number of atoms, we get 2N MOs that are so closely spaced in energy that they form what is known as a band of allowed energies. In metallic lithium only the lower half of this band is occupied. Metallic solids possess special properties that set them apart from other classes of solids and make them easy to identify and familiar to everyone. All of these properties derive from the liberation of the valence electrons from the control of individual atoms, allowing them to behave as a highly mobile fluid that fills the entire crystal lattice. What were previously valence-shell orbitals of individual atoms become split into huge numbers of closely-spaced levels known as bands that extend throughout the crystal. The strength of a metal derives from the electrostatic attraction between the lattice of positive ions and the fluid of valence electrons in which they are immersed. The larger the nuclear charge (atomic number) of the atomic kernel and the smaller its size, the greater this attraction. 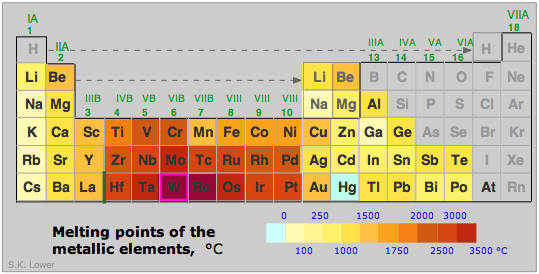 As with many other periodic properties, these work in opposite ways, as is seen by comparing the melting points of some of the Group 1-3 metals (right). Other factors, particularly the lattice geometry are also important, so exceptions such as is seen in Mg are not surprising. In general, the transition metals with their valence-level d electrons are stronger and have higher melting points: Fe, 1539°C; Re 3180, Os 2727; W 3380°C. These terms refer respectively to how readily a solid can be shaped by pressure (forging, hammering, rolling into a sheet) and by being drawn out into a wire. Metallic solids are known and valued for these qualities, which derive from the non-directional nature of the attractions between the kernel atoms and the electron fluid. The bonding within ionic or covalent solids may be stronger, but it is also directional, making these solids subject to fracture (brittle) when struck with a hammer, for example. A metal, by contrast, is more likely to be simply deformed or dented. In order for a substance to conduct electricity, it must contain charged particles (charge carriers) that are sufficiently mobile to move in response to an applied electric field. In the case of ionic solutions and melts, the ions themselves serve this function. (Ionic solids contain the same charge carriers, but because they are fixed in place, these solids are insulators.) In metals the charge carriers are the electrons, and because they move freely through the lattice, metals are highly conductive. The very low mass and inertia of the electrons allows them to conduct high-frequency alternating currents, something that electrolytic solutions are incapable of. 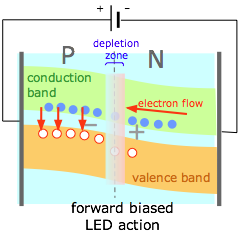 In terms of the band structure, application of an external field simply raises some of the electrons to previously unoccupied levels which possess greater momentum. The conductivity of an electrolytic solution decreases as the temperature falls due to the decrease in viscosity which inhibits ionic mobility. 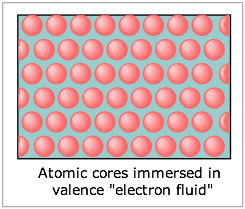 The mobility of the electron fluid in metals is practically unaffected by temperature, but metals do suffer a slight conductivity decrease (opposite to ionic solutions) as the temperature rises; this happens because the more vigorous thermal motions of the kernel ions disrupts the uniform lattice structure that is required for free motion of the electrons within the crystal. Silver is the most conductive metal, followed by copper, gold, and aluminum. Metals conduct electricity readily because of the essentially infinite supply of higher-energy empty MOs that electrons can populate as they acquire higher kinetic energies. This diagram illustrates the overlapping band structure (explained farther on) in beryllium. The MO levels are so closely spaced that even thermal energies can provide excitation and cause heat to rapidly spread through the solid. Electrical conductivities of the metallic elements vary over a wide range. 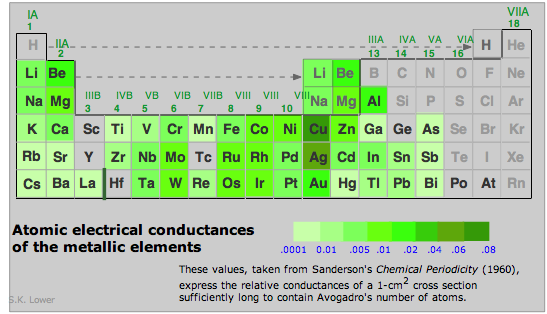 Notice that those of silver and copper (the highest of any metal) are in classes by themselves. Gold and aluminum follow close behind. Everyone knows that touching a metallic surface at room temperature produces a colder sensation than touching a piece of wood or plastic at the same temperature. The very high thermal conductivity of metals allows them to draw heat out of our bodies very efficiently if they are below body temperature. In the same way, a metallic surface that is above body temperature will feel much warmer than one made of some other material. The high thermal conductivity of metals is attributed to vibrational excitations of the fluid-like electrons; this excitation spreads through the crystal far more rapidly than it does in non-metallic solids which depend on vibrational motions of atoms which are much heavier and possess greater inertia. Appearance: why are metals shiny? 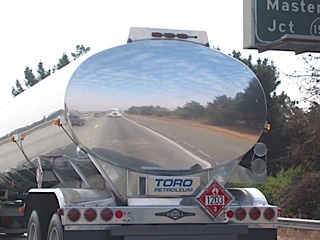 We usually recognize a metal by its metallic lustre, which refers to its ability of reflect light. When light falls on a metal, its rapidly changing electromagnetic field induces similar motions in the more loosely-bound electrons near the surface (this could not happen if the electrons were confined to the atomic valence shells.) A vibrating charge is itself an emitter of electromagnetic radiation, so the effect is to cause the metal to re-emit, or reflect, the incident light, producing the shiny appearance. What color is a metal? With the two exceptions of copper and gold, the closely-spaced levels in the bands allow metals to absorb all wavelengths equally well, so most metals are basically black, but this is ordinarily evident only when the metallic particles are so small that the band structure is not established. The distinctive color of gold is a consequence of Einstein's theory of special relativity acting on the extremely high momentum of the inner-shell electrons, increasing their mass and causing the orbitals to contract. The outer (5d) electrons are less affected, and this gives rise to increased blue-light absorption, resulting in enhanced reflection of yellow and red light. The electrons within the electron fluid have a distribution of velocities very much like that of molecules in a gas. When a metal is heated sufficiently, a fraction of these electrons will acquire sufficient kinetic energy to escape the metal altogether; some of the electrons are essentially boiled out of the metal. This thermionic effect, which was first observed by Thomas Edison, was utilized in vacuum tubes which served as the basis of electronics from its beginning around 1910 until semiconductors became dominant in the 1960s. Most metals are made of atoms that have an outer configuration of s2, which we would expect to completely fill the band of MOs we have described. With the band completely filled and no empty levels above, we would not expect elements such as beryllium to be metallic. What happens is that the empty p orbitals also split into a band. Although the energy of the 2p orbital of an isolated Be atom is about 160 kJ greater than that of the 2s orbital, the bottom part of the 2p band overlaps the upper part of the 2s band, yielding a continuous conduction band that has plenty of unoccupied orbitals. It is only when these bands become filled with 2p electrons that the elements lose their metallic character. 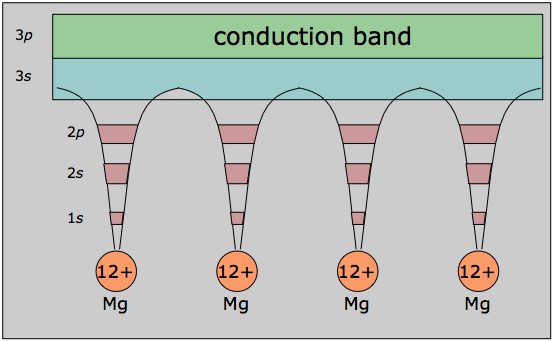 This diagram illustrates the band structure in a 3rd-row metal such as Na or Mg, and how it arises from MO splitting in very small units M2 - M6. The conduction bands for the "infinite" molecule MN are shaded. In most metals there will be bands derived from the outermost s-, p-, and d atomic levels, leading to a system of bands, some of which will overlap as described above. 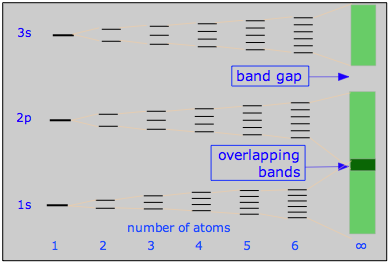 Where overlap does not occur, the almost continuous energy levels of the bands are separated by a forbidden zone, or band gap. Only the outermost atomic orbitals form bands; the inner orbitals remain localized on the individual atoms and are not involved in bonding. In its mathematical development, the band model relies strongly on the way that the free electrons within the metal interact with the ordered regularity of the crystal lattice. The alternative view shown here emphasizes this aspect by showing the inner orbitals as localized to the atomic cores, while the valence electrons are delocalized and belong to the metal as a whole, which in a sense constitutes a huge molecule in its own right. 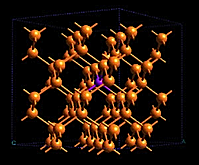 When P- and N-type materials are brought into contact, creating a PN junction. Holes in the P material and electrons in the N material drift toward and neutralize each other, creating a depletion region that is devoid of charge carriers. But the destruction of these carriers leaves immobile positive ions in the N material and negative ions in the P material, giving rise to an interfacial potential difference ("space charge") as dipicted here. As this charge builds up, it acts to resist the further diffusion of electrons and holes, leaving a carrier-free depletion region which acts as a barrier at the junction interface. A new class of organic PN junctions makes use of mobile positive and negative ions as charge carriers. 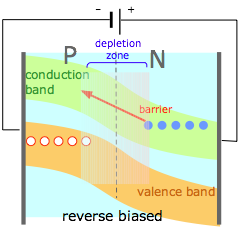 Many of the practical applications of semiconductors depend on the manipulation of this PN junction potential. Among these are certain types of photovoltaic solar cells. 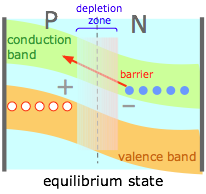 If an external potential difference is applied to the junction so as to counteract the space charge, the negative charge on the N side raises the energy of the electrons in the conduction band and of the holes in the valence band, reducing the barrier heights for both (and reducing the width of the depletion zone.) 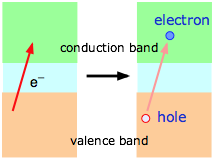 Electrons and holes can now tunnel across this zone. A forward-biased junction allows the PN junction as a whole to behave very much like a conductor. Another way of boosting the energy of the charge carriers to overcome the depletion zone barrier is to use a materials that are capable of absorbing light of an appropriate wavelength and which can efficiently couple the energy of the absorbed photons to the charge carriers. This is the basis of the very important photovoltaic or solar cell. There are many other kinds of photovoltaic cells. See this Wikipedia article for more information. If an external potential is applied to a PN junction so as to reinforce the space charges within the two regions, the barrier height and depletion zone width are increased, greatly inhibiting the flow of either kind of carrier into the opposite region. A PN junction thus acts as an electrical diode, allowing current to pass through in only one direction. 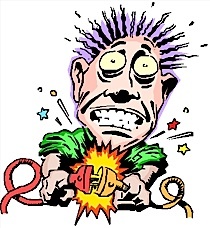 If an alternating voltage is applied to the diode, it acts as a rectifier, convering ac into interrupted dc. 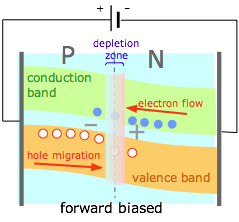 By selecting the right kinds of semiconductor materials, the electrons entering the P side of a forward-biased junction can be made to fall into the holes already present in the valence band (compare this diagram with (1) above.) 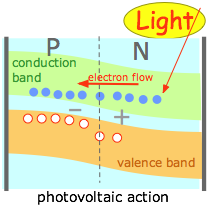 The energy lost by the electrons (vertical red arrows) is emitted as light, creating a light-emitting diode or LED. See this Wikipedia article for much more on light-emitting diodes. Explain the fundamental difference between the bonding in metallic solids compared to that in other types of solids and within molecules. Name some physical properties of metals that reflect this difference. 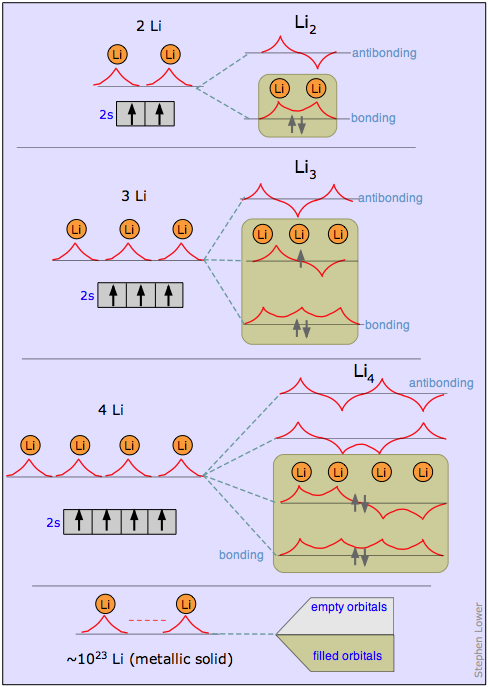 Sketch out a diagram illustrating how a simple molecular-orbital approach to bonding in metals of Groups 1 and 2 always leaves some upper MO's empty. Describe, at the simplest level, the origin of electron "bands" in metals. 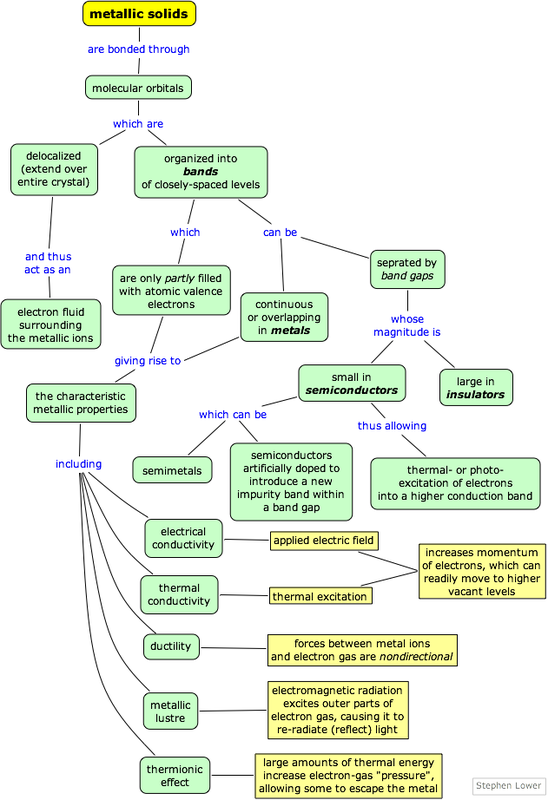 Describe how the electrical and thermal conductivity of metals can be explained according to band theory. Explain why the electrical conductivity of a metal decreases with temperature, whereas that of a semiconductor increases. This chapter covers the following topics: Properties of metals, molecular orbitals in metals, origin of metallic properties, band structure of metals, insulators and semiconductors, thermal properties of semiconductors, the PN junction, solar cells and LEDs. It can be accessed directly at http://www.chem1.com/acad/webtext/chembond/cb10.html.